By 1 June, the Water Corporation will have enforced a Winter Sprinkler Ban (WSB) in Perth, Mandurah, and select areas of Western Australia. This yearly prohibition on the use of irrigation systems is in line with the state’s water conservation efforts every winter, during which time the seasonal rainfall is enough to keep every lawn irrigated. ● Your watering days are Wednesday and Saturday if you get your water from the mains (scheme water). ● Monday is also a watering day if you get your water from underground aquifers (bore water). You can still use a garden hose to water your yard during the ban, although that would entail more work for you. The ban stretches from 9:00 a.m. to 6:00 p.m. and will last until 31 August. Since the ban saves billions of litres of water annually (e.g. 4.3 billion litres in 2012), do not expect it to be lifted anytime soon. If your lawn just can’t go a day or two without water, you may want to weigh the benefits of installing WA rainwater tanks. Since these tanks are connected to neither the mains nor the aquifers, they are excluded from the WSB. Such a tank does not have to hold a lot of water, either. According to a study sponsored by the National Water Commission in 2007, a 2,000-litre rainwater tank can yield 7.5 to 14 times its capacity annually for outdoor use, depending on the roof area. To prevent the tank from spilling precious rainwater, make sure the size of the tank is relative to your roof area and water use. The shrinking average lot size in Perth should be no hindrance to installing rainwater tanks from manufacturers like Rainfill Tanks and Curved Roofing Supplies. 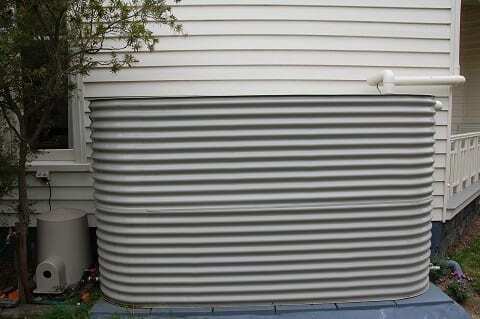 Perth slimline water tanks can be placed between the house and boundary fence, making good use of available space. With the addition of filtration systems, you can even have water fit for drinking purposes.